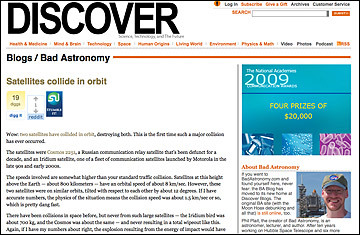 Bad Astronomy is the work of Phil Plait, a good astronomer who used to work on the Hubble Space Telescope, a device which started off bad but ended up good. Got it? Plait is a born skeptic  his blog regularly battles the misuses of science in daily life, in addition to praising the wonders of legitimate research. Whether its debunking the theory that the measles vaccine causes autism or taking on conspiracy theorists who insist that NASA faked the moon landings, Plait is a voice of reason amidst the nonsense of non-science. Bad Astronomy is also a reliable guide to the latest in good astronomy, like the stunning recent photos of Centaurus, an elliptical galaxy with a massive black hole at its core. Sample Bad Astronomy post: We already know vaccines don't cause autism. The anti-vaxxers yell loud and long, but their evidence is anecdotal and doesn't hold up to scrutiny. But because the forces of antiscience are so vocal, we need to keep restating the obvious. Entry you'll never see: Why is the government spending so much money on exploring space? We've got enough problems right here on earth.